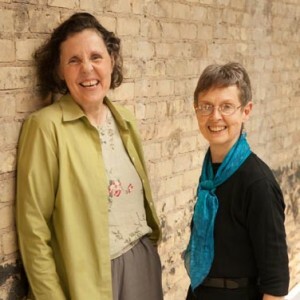 We are so excited to announce the success of the Monday, Janua ry 25th performance of Mortals and Angels: A Bluegrass Te Deum at Carnegie Hall on the DCINY Concert Series! And what an exciting night it was! Music, rhythm, and spirit all around us, and none of it would have been possible without your support! Check out the details of the concert by clicking here. From the whole team of Soaring Dreams, Carol, and Marisha, a big THANK YOU! You have allowed the world to keep bluegrass alive in a unique and refreshed way in one of the most distinguished concert venues in the world, Carnegie Hall! Because of your support, future generations can continue be inspired by incredible pieces such as Mortals and Angels. Check out what New York Concert Review Inc had to say about Mortals and Angels! “The text of the work flows with a natural ease, and the music is sincere and without any pretense. This is a winning combination…” Read the full review here! Bill Monroe, legendary bluegrass musician, once said, “Bluegrass has brought more people together and made more friends than any music in the world.” What a beautiful world we live in that we can bring the uniqueness of bluegrass on the Carnegie Hall stage, and carry that message throughout its historic acoustics. 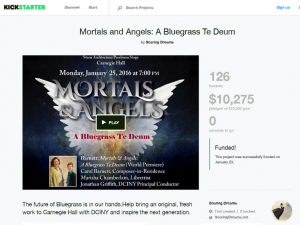 Mortals and Angels: A Bluegrass Te Deum did just that, and wouldn’t have been possible without your contribution. Following the success of the Monday, January 25th performance of Mortals and Angels at Carnegie Hall on the DCINY Concert Series, every single audience member was beaming with grace, music, and a sense of community surging through their bones. The Hall transformed from an audience and a stage of performers into one big family. It was truly a sight to see! Music, rhythm, and spirit all around us, and none of it would have been possible without your support! You have allowed the world to keep bluegrass alive in an unparalleled and refreshed way in one of the most distinguished concert venues in the world, Carnegie Hall! Because of your support, future generations can continue be inspired by incredible pieces such as Mortals and Angels. Distinguished Concerts Singers International with Dailey & Vincent under the baton of Dr. Jonathan Griffith. Monday, January 25, 2016, 7pm, Isaac Stern Auditorium/Ron Perelman Stage, Carnegie Hall, New York, NY.